On 29 September 1958 John Barbirolli conducted Part 1 of Gerontius with the Dublin Choir in the presence of Pope Pius XII at Castel Gandolfo, only a few days before the Pope's death. 'I have often wondered', he wrote, 'what the feelings of Newman and Elgar would be if they could know that the last music [the Pope] heard had been Elgar's setting of Newman's words "Go forth upon thy journey, Christian soul". As Barbirolli knelt before him, the Pope said: 'Figlio mio, questo e un capolavoro sublime' ('My son, that is a sublime masterpiece'). 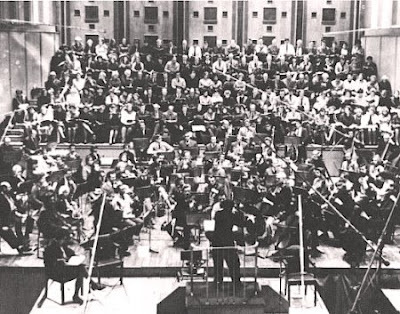 The header photo shows Sir John Barbirolli recording The Dream of Gerontius in 1964 in the Free Trade Hall, Manchester. No CD collection is complete without Barbirolli's Manchester account or Benjamin Britten's version which was recorded in Snape Maltings, the latter is now, thankfully, back in the catalogue - grab it while you can. Also noteworthy is the recent first-ever CD release of Barbirolli conducting Gerontius in Rome in 1957 with the RAI Rome Symphony Orchestra and Chorus. This super-budget version from Archipel has come available because the original recording issued on LP is now out of copyright. Despite the poor quality of the RAI sound the Rome recording is an important historical document as it is the only version with the incomparable Jon Vickers in the title role (the Hallé version has Richard Lewis). But Barbirolli's Manchester version is the one to have, as the Holy Father said 'that is a sublime masterpiece'. Now read about Glorious John in New York. Just unearthed and am listening to my mono LP set of the Barbirolli recording. Still sounds just fine. A historical sidelight (mentioned in the booklet) is that Barbirolli used a copy of the score which had belonged to General Gordon (Chinese Gordon ... Gordon of Khartoum) in which Gordon had marked his favourite passages. Richard Lewis is excellent, but I can imagine Vickers in the part, and you may have pushed me to buy the Archipel recording, poor and inconsistent sound notwithstanding. 'As early as 1888/89 Elgar was considering a sort of Eroica Symphony about General Gordon, the colourful and eccentric hero who had been martyred in the Sudan. Elgar had received a copy of Cardinal Newman's The Dream of Gerontius as a wedding present in 1889. In it were reproduced underlinings and markings that General Gordon had made in his own copy at Khartoum five years earlier. The Gordon Symphony was never to be, but Elgar returned to Gerontius ten years later and produced a masterpiece'. Wasn't aware of this. And speaking of other paths (overgrown or otherwise) - listening to the Barbirolli Gerontius reminds me that if I have a Janet Baker recording that is less than excellent, I don't know what it might be. Now listening to her Philips LP of Handel arias with ECO/Leppard. I'm no expert, but if I were asked for an example of singing that transcended considerations of authenticity, I might well choose the final cut from this LP - O had I Jubal's lyre from Joshua. I join many in preferring the 1964 Barbirolli studio recording of this, but, when last I heard much of it, found the Britten a bit rigid, and one wonders why the composer who reputedly insisted that his music go _EXACTLY_ as he prescribed decided to add a couple of percussion crescendi in the Prelude to _Gerontius_. I have heard it said that Mr. Lewis had a cold when he recorded this work with Sir John, and some suggest that his account with Sir Malcolm is better. I have not heard much of that earlier recording, but, despite his light voice, I personally feel he gets the expression _JUST_ right in the Barbirolli, and hope that Elgar, had he been able to hear it, would have found his performance passionate enough! It would be at least interesting to hear Mr. Vickers in that role, but maybe the flaws could prove a significant-enough factor against having a go, that is unless this label is a budget one. By the bye, I personally find Sir John's way with the opening of "Be Merciful, Be Gracious" especially effective as per phrasing. At least virtually every other conductor I have heard in this passage phrases it legato, though they let the phrases rise and fall in dynamics. I again personally feel that Sir John's break between the first two and last two words works _MUCH_ better, and wonder if there is any authority in the score for so treating this passage. Yet, despite his frequently-detailed markings, it is said that Elgar was prepared to allow, if not embrace, interpretations differing from his own, so maybe this deviation, if deviation it is, could have been sanctioned by the composer had he lived long enough to hear it. Something similar happens in the "Meditation" from _The_ _Light_ _Of_ _Life_ where virtually everyone, the composer included, phrases the passage shortly to be associated with the blind man's "O Thou in Heaven's Dome, Heaven's Dome" and "All all is dark to me, dark to me" nearly legato, whereas Sir Charles Groves, on his 1981 recording of the complete oratorio, has the horns phrase it as it eventually will be sung. It may just be that this is how I first came to know it, but again I think having the horns conform to the rhythm of the words makes more sense. Yet further, when this passage occurs for the first time in the "Meditation," the first horn is doubled by a clarinet, even in Elgar's own recording, whereas Sir Charles omits this, though maybe I should recheck this passage in his earlier recording of the "Meditation" on its own. Returning to _Gerontius_ to close for now, I further think that Sir John gets more out of the first "most surely" in "Praise To The Holiest" than any other conductor I have yet heard, also including the composer if I am not mistaken. No one mentions HEEDLE NASH here in the role of Gerontius. Granted, he never sang it under Sir John, but he is most certainly the "owner" of the part if anyone. I lost all I had written here when I tried to post! too long... when I logged in, I lost it all.